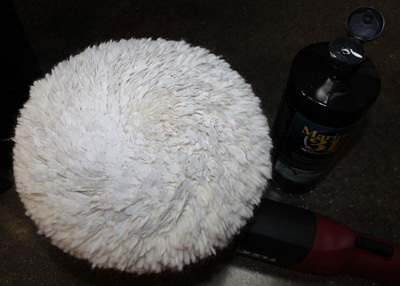 Clean, degrease, restore and renew all buffing pad types! During: Cleaning a pad takes seconds! After: Pad looks, feels and performs like new! �How come I didn�t think of that?�: These are the words that will come to mind the first time you use the Marine 31 Universal Pad Washer. With the power of your dual action, random orbital or rotary polisher, the Marine 31 Universal Pad Washer deep cleans buffing pads of all types, leaving them looking, feeling and performing like new. Using the Marine 31 Universal Pad Washer is as simple as inserting the pad into the pad washer and turning it on. The grid insert will do all the work for you � just hold on and smile! Spent residue and oxidized gel coat is a buffing pad�s worst nightmare. If you neglect to clean your pad after section, the chemicals in the polish combined with the oxidized gel coat will get caked up on the pad, affecting its integrity and mechanical cutting ability. When you go to use that pad for the next pass, your compound will not be as effective, making the process of polishing your boat a tedious and seemingly endless process. 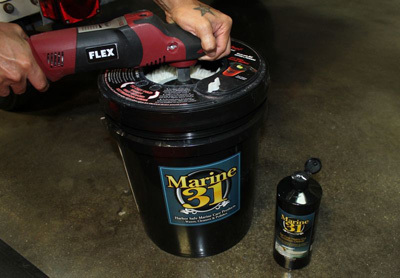 With a few quick pumps of your polisher, the Marine 31 Universal Pad Washer will remove spent residue and oxidized gel coat, leaving your pads looking and feeling new! The Marine 31 Universal Pad Washer works with polishers of all types, including the Cyclo, Porter Cable 7424XP, Meguiars G110v2, FLEX XC3401, DeWalt DWP849X, Makita 9227CX and more! The grid insert�s large diameter allows pads of all sizes to make contact, no matter how big the orbit. The top of the pad washer has a conveniently placed opening lid that makes inserting rotary polishers with big wool pads quick and easy. The Marine 31 Universal Pad Washer accommodates all dual action, random orbital, rotary and circular polishers. But wait, there�s more! 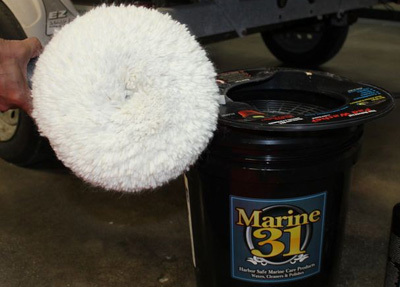 Not only does the Marine 31 Universal Pad Washer remove stubborn compound and polish residue from all types of buffing and polishing pads, it dries them as well! Simply lift the pad out of the water and raise the speed setting slightly. Allow the pad to spin until the excess water has been removed. The lid will prevent any water or cleaner from getting splattered onto your clothing. Keep the pad�s Velcro� brand backing out of the water when using the Marine 31Universal Pad Washer. Always use the Marine 31 Universal Pad Washer with the polisher on its lowest setting for cleaning. You can use a slightly higher setting for drying.